This post was written by Tracee Haupt, an intern at the National Museum of American History Library. Tracee is a graduate student in the University of Maryland’s dual-degree master’s program for History and Library Science. At six and a half feet tall and three hundred and fifty pounds, Willie Vocalite was an imposing figure. 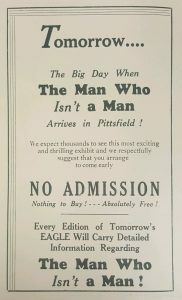 “The Man Who Isn’t a Man,” as a 1934 booklet uncovered in our Trade Literature Collection described him, was barrel-chested with gleaming red eyes and a friendly expression. He was often pictured with a cigarette hanging jauntily from his lips, and later in his career he adopted a fashionable mustache that gave him the cavalier look of a 1930s movie star. 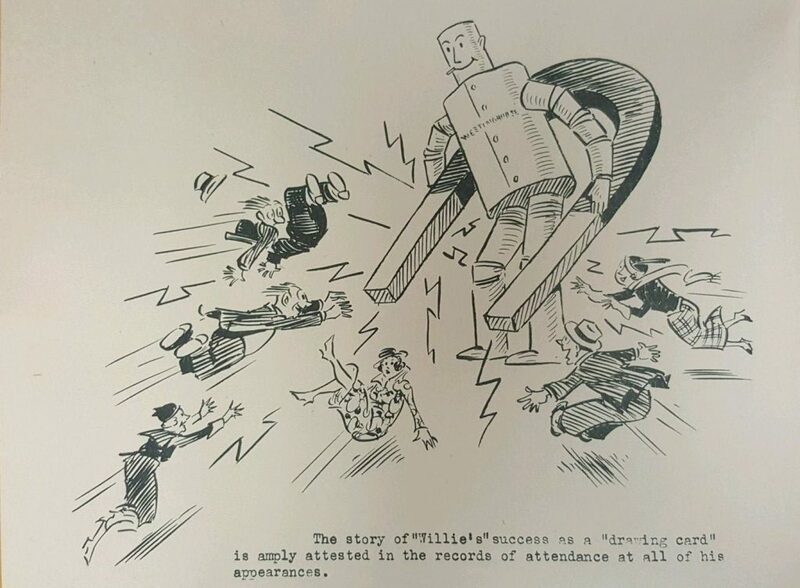 Willie was a star of sorts–beginning in 1931, his act toured America from coast to coast drawing hundreds of thousands of spectators eager to see the “world famous robot” who could move, talk, and respond to voice commands. 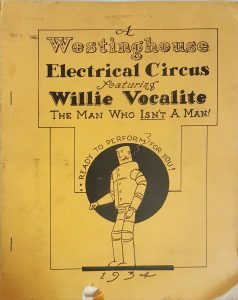 Billed as “A Westinghouse Electric Circus Featuring Willie Vocalite,” the act was a clever way to promote and sell Westinghouse appliances. J. M. Barnett, a Westinghouse engineer, conceived the idea for the robot, and his equally celebrated predecessors, Herbert and Katrina Televox. Lest anyone think that it was a gimmick or a hoax, an announcer at the beginning of every show explained that $22,000 and two years of intensive research by the country’s best electrical engineers had gone into creating him. The robot’s performance was intended to boost the brand’s prestige by demonstrating the type of cutting edge technology that went into Westinghouse products. Dealers were encouraged to host Willie at their store where he promised to attract customers and generate increased profits. As a salesman, “‘Willie’ Vocalite has never failed to exceed his ‘quota,’” the booklet boasts, which was especially remarkable considering that he performed during the lean years of the Great Depression. To maximize the impact of the performance, Westinghouse dealers were advised to begin advertising Willie’s act a week in advance, building curiosity with ‘teasers’ in local newspapers, flyers handed out to potential customers, and posters placed in windows and elevators. The stores were then peppered with ‘Vocalite specials,’ and the most advanced models of refrigerators, range ovens, washers, vacuum cleaners, and food mixers were placed in prominent spots near the stage where Willie was set to perform. Parents were encouraged to bring their children to the free show, and additional salespeople were added to handle the expected influx of customer traffic. 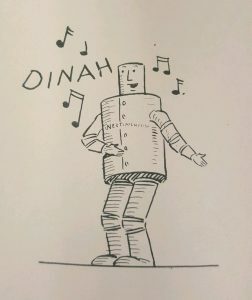 So what exactly did a “world famous robot” of the 1930s do? On stage, Willie amazed audiences by standing up from a sitting position, impersonating a Bing Crosby song, saluting the crowd, and beeping a car horn, all at the prompting of verbal commands spoken through a telephone. During a brief interlude, Willie’s supporting act, a Westinghouse vacuum nicknamed the “Galloping Ghost,” moved across the stage without anyone guiding it, and then Willie returned to indulge in what the announcer admitted was the “bad habit” of smoking. For the finale, Willie demonstrated his ambidexterity by raising a flag and shooting a cap pistol at the same time. As an epilogue to the “electrical circus,” the presenter used high voltage electricity to create large sparks and add color to a neon tube. Willie was meant to “exemplify all that science is doing to make life easier for man,” and some predicted that one day everyone would have their own “Willie” in their home to act as a personal assistant. At a time when domestic life had so recently been transformed by revolutionary technology like electricity, telephones, and radios, the idea of robots in the home did not seem so far-fetched. Willie’s star faded in 1939 when Westinghouse debuted Elektro, a more advanced model paired with a robot dog named Sparko. Before Willie was retired, he had performed in all fifty states, including a cruise to Hawaii in 1937. He was also a star attraction at events like the 1933 Chicago World’s Fair and the 1939 Golden Gate International Exposition.